Model: Marisa, a special person. I took the picture in Spain, recently. provided by Samsung Electronics. Co., Ltd. The Eyes are stunning...in fact the whole portrait is stunning!!! theres a story in this picture. These eyes are so piercing. They make me feel like they can see hidden parts of my mind. Disturbing and relaxing at the same time. 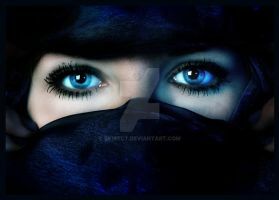 Are her eyes really that magical or a bit of photo manipulation? Her eyes are amazing. They look like fire, or the Hubble close-up pictures of stars, only in a tigers-eye brown. Also, some people said they might be photo-manipulated, but it looks more like she just has pretty eyes, with light reflecting in them, and her pupils are really small probably because there's very bright light. Beautiful photo! I really love the colors. She is absolutely breath taking. It is amazing that you captured that in such a good picture. Her eyes look like they're planets in them. They're breath-taking! My God those eyes! Made me scared to look away! Your work is featured in my "MOMENTS OF INTENSITY 2011 - Part 11" - maybe you like it. The colors here are beautiful! I love the way you drew the attention to her eyes with contrasting colors. Are those really her eyes? Omg, not real! Her eyes are incredible! and hypnotic! Yay! I’m very glad to announce you that your artwork has been chosen to be amongst the best deviations submitted to our in the month of September 2011. You can check it out here: [link] & here: [link] . P.S. Please, don’t forget to show us some love by ing the News Article. If you had seen this News Article faster than we got to announce it to you, even better! Incredible eyes. Blue eyelids makes them stand out even more. Lovely shot. You have OBVIOUSLY PHOTOSHOPPED her eyes extremely (well). Maybe some explaination would put it to rest, unless you want everybody to believe that's what she looks like naturally. Not answering a single person isn't cool - either. Yes but photoshopping is a type of art and while i kind of agree it should have been mentioned in the description just like he mentioned the camera it was shot from it is not really necissary because it is fairly obvious.